The Rules start out describing an “emergency” dating back to the occupation of the Capitol over 2 years ago, that only lasted a few weeks. 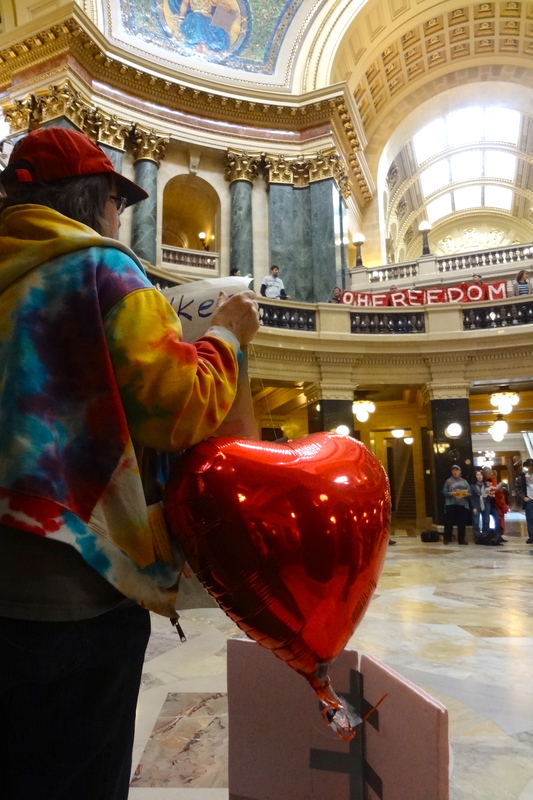 It goes on to state “Groups of persons continue to occupy rooms in the Wisconsin State Capitol building without permits, including the Capitol rotunda.” This is untrue. No one has occupied any rooms in the Capitol for over 2 years. There is a singalong that takes place in the rotunda at noon, Monday through Thursday, if there is no permitted event going on inside. If there is a permitted event, the Singalong takes place outside, and is always outside on Fridays since there are instruments included and these are not allowed inside the Capitol without a permit. The rules for the Capitol state that working hours end at noon and start again at 1 pm. So the Singalong is not interfering with working hours. The Rules also claim that there have been disruptions to events “…including but not limited to, a Red Cross blood drive, a high school science exhibit, school group tours, general public tours, and legislative committee meetings and sessions.” This is also not true. The Singalong is outside during events that have permits. If this is referring to people holding signs, I have donated blood during blood drives. People working there have told me the signs do not bother them. School groups come in during the Singalong. Sometimes the kids goo into the middle of the rotunda and even lie down to take photos of the mural under the dome. No one blocks them, and people even encourage them to do this if they wish. I have encouraged people to go to the center, if they want a good photo. I have also given people information about the Capitol and which elevator to use to go to the Observation deck. Tours do not start until 1 pm, after the Singalong. As for legislative meetings and sessions, I have attended those when the Singalong is going on. You cannot hear the singing inside the hearing rooms or Legislative floors. I’m not sure why the science exhibit is mentioned. There was a college exhibit and I walked through. The people were interested in the signs. Again, the Singalong would be outside during an exhibit. The Department of Administration has made rules restricting the activities of people at the Capitol. This means for people who hold signs, banners and sing at the Singalong. Rules about banners say they cannot be held inside over a railing because they could endanger the safety of people below if they fell. Banners are generally made of cloth. They could not hurt anyone if they fell on them. Banners have been confiscated even when they are tied to the people holding them and so could not possibly fall. Outside banners are not allowed over the railing. There is no logical reason for this. The railings are made of granite, which is one of the hardest rocks known. This is why the Capitol is covered in granite. Cloth cannot possibly damage granite. And there is no danger of them falling on anyone. 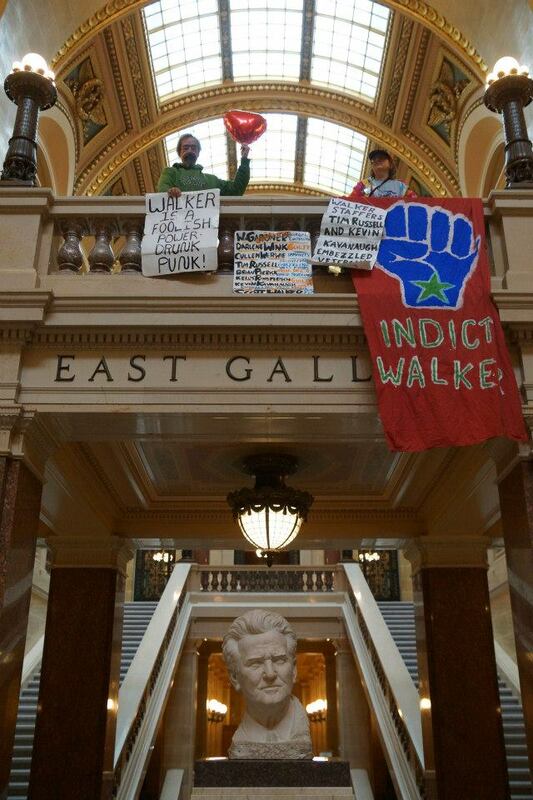 Genie Ogden holding her Indict Walker banner above “Fighting” Bob LaFollette during the noon hour Solidarity Sing Along at the Capitol. 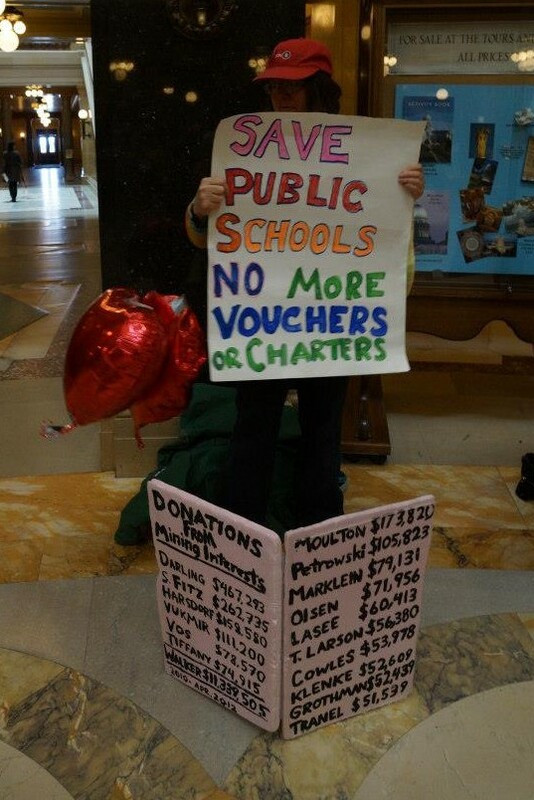 Signs in the Capitol must be held, again out of fear they could fall and injure someone. And they cannot be held over the railing, for the same reason. Even though for almost 2 years there were no injuries with people holding them this way. People not associated with the Singalong often drape coats and other things – even legs, over the railing with no consequences. And the new rules have a limit on the size of signs – no larger than 28″ in width or height. What is the reasoning for this? If I have a sign that is 27 3/4″ wide will it be much less “dangerous” than one that is 28″ wide? And I measure the signs that legislators hold when they are getting their photos taken with school groups – the Sen. So-and-so is proud to welcome such and such school. They are 37″ wide. Will the Capitol Police be forced to measure every sign? I would think the DOA would not want to waste their time doing this. The Singalong has been going for over 2 years. I believe the Guinness Book of World Records is interested in including it. 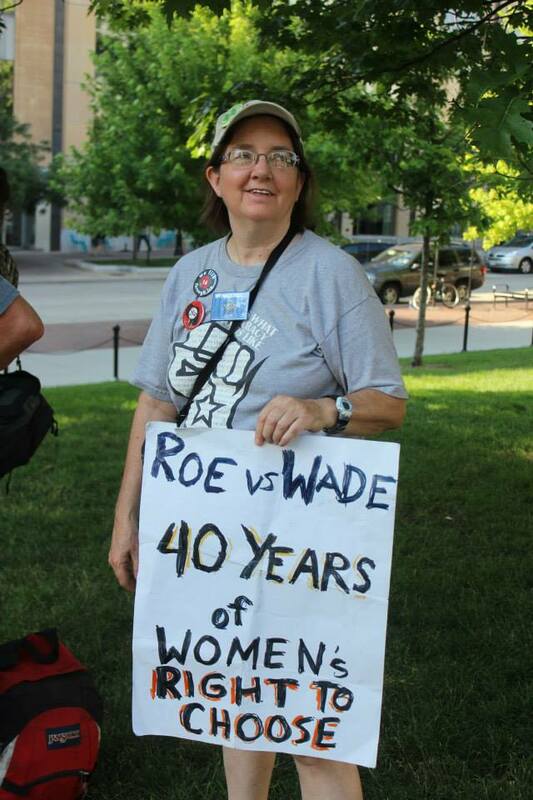 I would think the DOA would be proud to have Wisconsin and the Capitol included. I would think the Dept. of Tourism would want to attract tourists by noting this. The only Capitol in the country with a Singalong. Bob LaFollette would be proud. The cost of these rules for taxpayers should be considered. I have been ticketed 6 times. There were 3 arrests, and 3 tickets were delivered to my house by the Capitol Police. I wonder what the cost for police enforcement is? And the cost of the gas and maintenance for the Police vehicles – the 2nd ticket was one of many the officers were delivering that evening. They drove all over the city and to a town outside of Madison twice because the person was not there the first time. Other people received tickets through registered mail, which costs money. There were also numerous court dates. Over 160 tickets have been dealt with by the courts because of the DOA rules. This wastes the judges’ time and the DOJ attorney’s time too. They should be dealing with real crime, which is backed up in the courts already. I was supposed to go to jury trial. The people in the police dept. had a 50-page affidavit for my balloon “crime.” It was well-researched and must have used up a lot of attorney time. The balloon case dragged out over 9 months. The judge ended up combining it with the 2 chalking tickets into 1 trial, which was not fair to me. There would have been 5 police officers plus 2 others from the Capitol Police dept. testifying against me. But a lot of time was spent by the AGAs when they could have been dealing with serious crimes. The waste for taxpayers must be enormous. And the new rules state – “Whoever does or attempts an act for which a permit is required under this section without first obtaining a permit may be fined…or imprisoned…or both.” Again, more waste of taxpayer money. Especially the intent to use the jail for non-criminal purposes when it’s already overcrowded with real criminals. The Sheriff will not be pleased. This is about doing things which the Wisconsin Constitution permits. Expressing discontent with the government is protected and a part of our rights as citizens of Wisconsin and the US. I hope the Department of Administration will rethink these new rules. They are unnecessary and a further violation of rights, as well as costly for taxpayers.